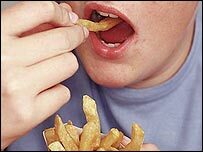 A meal at a fast food restaurant could expose children to "staggeringly" high levels of salt, a survey has suggested. Lobby group, Consensus Action on Salt and Health (Cash), found one meal from Pizza Hut contained four times the daily limit of salt for a six-year old. KFC also did poorly in the analysis of hundreds of food items, which also included McDonalds and Burger King. All the restaurant chains said they had reduced salt levels considerably in their products in recent years. The government recommends a maximum of 6g of salt per day for adults, 5g a day for children aged 7-10 and 3g for children aged 4-6. According to the Cash survey, a family of four sharing a Pizza Hut meal deal - consisting of one Cheesy Bites Meat Feast, one medium Super Supreme, a portion of garlic bread, a portion of potato wedges, chicken wings, and a cheesecake dessert - could eat 12.3g of salt each. The amount of salt consumed in one meal is more than twice the daily limit for an adult and four times the daily limit of a six year old. A family meal from KFC - consisting of eight mini breast fillets, two regular popcorn chicken portions, four regular fries, a large portion of BBQ beans, a large coleslaw and a 1.5 litre Pepsi shared equally between four - could contain 5.2g of salt per person. Of meal combinations aimed specifically at children, the salt content varied from 4.3g of salt in a Pizza Hut chicken wrap and a soft drink to 0.6g in a McDonald's Happy Meal of chicken nuggets and a fruit bag. CASH said all the restaurants had information on the salt content of their food on the company websites, but Pizza Hut and KFC had no information at the point of sale. They called for all restaurants to carry nutrition information so people could make informed choices. "It is over four years since the maximum daily limits for salt were established for adults and children," said Professor Graham MacGregor, chairman of Cash. "And yet this survey shows that the salt levels in some of these meals are staggeringly high. "How can these companies justify selling food that contains more than the maximum daily limit for adults and children in a single meal?" He added that high levels of salt in childhood contributed to increased blood pressure and risk of heart attack in later life. A spokesperson for Pizza Hut said the pizzas highlighted in the survey are not part of a family meal deal and that they had been working since 2004 to cut the salt in their foods. "Every sensible parent knows that Pizza Hut is an enjoyable treat and we have significantly reduced the salt levels in our products over the past few years." A spokesperson for KFC said they had reduced salt by up to 30%. "We were the first - and remain the only - fast food chain to have removed salt from our fries, leaving customers to choose whether they want to add salt or not." McDonalds said they had worked hard to make significant reductions in salt levels and would continue to do so. Burger King said their burgers had no added salt.